It is imperative to understand that we live in a world where nothing is impossible. If we don’t have a solution yet, we can build it ourselves, thanks to the knowledge and resources available in abundance. 9 year old Aidan Robinson was born with a left limb that ended just below his elbow. Having tried several “traditional” prosthetic arms while growing up, Aidan realized that all of those arms left a lot to be desired. Of course, he was also outgrowing those expensive arms very quickly too. While attending a summer camp organized by KIDmob, Aidan bumped into Coby Unger, maker and designer at Autodesk, a 3D software design company. Coby was immediately impressed by Aidan’s presentation and ideas for his desired prosthetic limb, which revolved around it being a sort of multi purpose tool, with an attachment for each purpose. He decided to bring Aidan’s ideas to fruition. Coby printed parts for Aidan’s arm on a MakerBot 3D printer and reshaped them so that they would fit Aidan’s limb accurately. The socket portion, that fits on to the limb, is built out of PLA plastic covered with a velcro sleeve. There is also a ratchet knob from a snow board binding that gives the starfish part (that wraps around the arm) on the top some tension. Finally, there is quick release clamp from a bike that holds the attachments together and lets Aidan change them easily. The end of the socket has a hole to mount each attachment easily. attached to the socket so Aidan can play a two handed Wii video game easily, a fork and spoon attachment for eating, a violin bow attachment so Aidan could play the violin, a bike riding arm, and a Lego attachment (Aidan’s idea) which would let him build Lego blocks on his arm for recreational purposes! Watch this video to see how intuitive and easy it is for Aidan to use these attachments on his left prosthetic limb. Description of video: 9-year-old Aidan Robinson spent a week prototyping his own new prosthetic arm. Once that week was over designer Coby Unger worked with him to develop his ideas further. Aidan’s New Arm from Pier 9 on Vimeo. 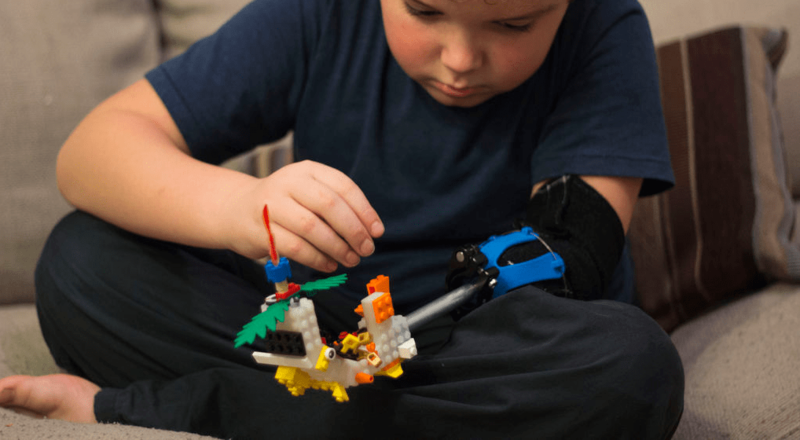 With Aidan’s positive attitude and Coby’s zeal and willingness to help Aidan, a new platform has been invented which shuns the idea of having a limb with fingers to perform daily tasks as the most ideal prerequisite. Coby has uploaded instructions on how to build this multipurpose attachment prosthetic arm on the internet.